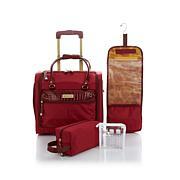 Travel lightweight and luxe with this easy expandable duffle from Samantha Brown. Loaded with travel-friendly features in a streamlined profile, this perfectly packable bag is ready to get up and go wherever you want to roam. I got the gray and this duffle looks super chic and different. The size is perfect for carry on but can tell this will hold as much as a 21 inch. Cant wait to use to change up from always using a roller bag. Perfect for casual non business related trips. I chose the gray duffle to pair with my black/white ombre set. 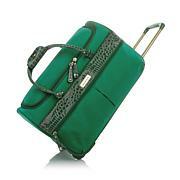 It's a perfect coordinated look; and its design is more suited for use by my husband when we travel together. Works well to carry all of his items for a 3-4 day getaway. 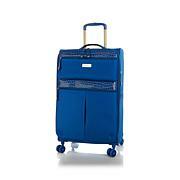 Its collapsible material is very sturdy and makes it easy to pack/store. Saw this and thought it would be the perfect edition to the drop bottom and back pack. These 3 will be perfect for a long weekend get away! Love the lightweight washable fabric, the classy look with details, and the best, the fact that it is something different than most duffels - expandable, and packable!samantha got this one perfect! 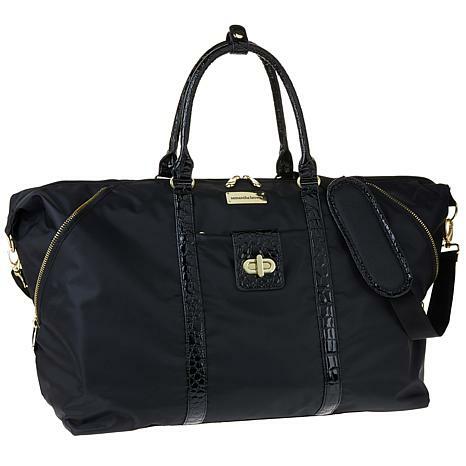 I've been wanting a duffle for awhile and saw this on HSN. Love this bag and love that I can use the packing crates with it. 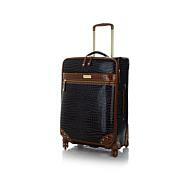 It also matches the croc leather luggage I bought in red a couple years ago. Love her products and will buy again.